Because of its clear blue waters and mostly cloudless skies, Heron Island is one of a handful of sites worldwide where scientists from the United States, Bermuda and Australia have converged with a tricked-out NASA Gulfstream jet to modernize the way the world looks at its fragile coral reefs, an early warning system of a changing climate. 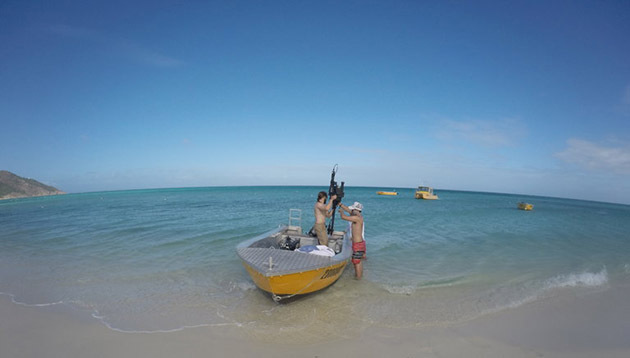 Scientists will use a special sensor to map the conditions of large portions of the reef in fine detail, gathering data from 28,000 feet above to produce a real-time picture of how much sand, coral and algae make up big stretches of the Great Barrier Reef. They hope the flights will prove the sensor’s worth, leading to it being placed on a satellite and ultimately unraveling some of the mysteries of how reefs adapt to man-made and natural stresses, how they calcify, and how much photosynthesis takes place on reefs and where. Coral is made up of millions of tiny animals called polyps that form symbiotic relationships with algae, which capture sunlight and carbon dioxide to make sugars that feed the polyps. When waters warm, corals evict the algae, known as zooxanthellae, which causes the coral to turn white. In the past, reef science has mostly involved scuba divers and intensive, small-scale, plot-based studies that can reveal much about a small slice of reef but cannot necessarily be extrapolated to gauge the health of the entire Great Barrier Reef, which covers an area roughly the size of Germany. “This is a real step up in the way reef science is done,” said Eric Hochberg, the project’s chief investigator, from the Bermuda Institute of Ocean Sciences.